You have been making healthy choices. You even made it through Halloween without overdosing on mini candy bars. But now Thanksgiving looms over your will to eat healthy, threatening to shatter it with Grandma’s Pecan Pie, and a handful of recipes that each call for multiple sticks of butter. What is a healthy hottie to do?? Fret not Gorgeous! I’ve got you covered with lots of help this holiday season! This Monday we will kick off with a Healthy Holiday Hotties menu for Thanksgiving. To be sure your favorite temptations are covered, please reveal your guilty pleasures below in the comment section and I’ll do my best to offer up a healthy twist. After Thanksgiving the holiday parties kick into high gear, which means ample exposure to eggnog, brie, roast beasts of all kinds and plenty of booze to wash it all down. Hook a hottie up with a health preserver! So let’s get these holidays off to a healthy start. Describe the holiday foods you love, but would prefer a healthier option. I’ll go first. 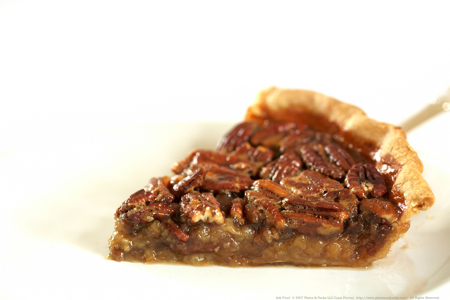 Pecan Pie! It’s pretty much pure fat and sugar with a processed flour crust. It is an act of human spirit to pass on something were are so biologically hardwired to stock up on. I will share a vegan version of this holiday fave with a delicious pumpkin twist. Post the foods you crave below. Check back Monday for the complete Thanksgiving Menu with all the recipes. Chocolate chocolate chocolate!! Raw chocolate fudge packs on the weight quickly for me, so I’d love to see something to satisfy my chocolate cravings without being so dense and heavy like the traditional dates and nuts. Also, it’s very hard to find a good recipe for creamy CHEESE dips. Maybe something rich and savory to help me avoid a breakout when I cave to cheese cravings? I am soooo glad that my cry for help on pecan pie is about to arrive. This is the hardest to resist over the holidays. Thanks for looking out? -Pie and Ice Cream – apple pie, pumpkin pie, etc.. This is awesome Joy!! I love what you’re doing! You are such an inspiration! THANK YOU!!!! Hmm….. I’d love to know an awesome holiday themed kale recipe… or for a guilty pleasure..
maybe stuffing, gravy, green bean casserole or sweet potato pie? Haha! So stoked to hear about all of your makeovers! This will be very exciting to see what you can come up with. I love egg nog can you come up with a healthier raw version that tastes good! Where can you find the link to sign up? I hear you, that stuff is addictive. Don’t worry. I’ve got you covered!! Will post Monday night in time to shop for the holiday. That’s it, make me work for it! I am thrilled to share a kale recipe for sure, and just for fun I will create and all in one dish that combines most of the flavors you are mentioning. Once a gain a reader with many wishes- thank you! I can help with healthy versions of everything but Brussel sprouts and red wine. I’m skipping the sprouts because I have an aversion to them (my dirty secret is out!) and the wine because it’s already raw and even Christ enjoyed it- so live a little!! Healthy cheesecake- YES, I can help with a version that no problem! I am right there with ya sista! It’s like it is calling my name even while it is baking in the oven. I hope you enjoy it. I’m thrilled you’ll be joining us in choosing healthy eats over the holiday! Post for you on Monday. I am happy to help. I think you will really enjoy the artichoke dip that is made in a cashew cheese. The cashew cheese itself is quite flexible, I switch up the mix-in ingredients to flavor it in in lots of fun ways. I’ll be sure include alternate options to keep you healthy all year round! No need to sign up! I’ll post the link her on the site. I’ve had a fantastic time doing the Rockin Body Raw Food diet and have prepared dinners for my family and friends… and received lots of raves! I’m super excited about the Thanksgiving recipe make-overs, thank you. I’d love to try something for stuffing! I am thrilled to hear you are sharing the Rocking Body Raw Food recipes with your family and friends! Way to be an ambassador of health and vitality to your community. I have one stuffing recipe on the Thanksgiving Menu Plan and there will be another in the Christmas Dinner on the 12 Days of Christmas Meal Plan that comes our on December 11th. Both recipes are veggie, vegan and GMO & gluten-free, but it is a cooked dish. Tis’ the season for belly warming yumminess! I am happy to help with your awesome request. Be forewarned that the healthy versions of desserts I make do have sugars- there are many sweetened with whole food sweeteners, like maple or dates- but even those are natural sugars. If you are watching where foods fall on the glycemic index- look for the ones sweetened with lacuma, mesquite, and Jerusalem artichoke syrup. One very simple no-added-sugar dessert is banana ice cream. When bananas are quite ripe (plenty of brown “happy spots” as we call them at our house), peel them and slice them into 1 inch pieces. Freeze, making sure they do not clump together. When you want ice cream simply blend them in the Vita-Mix and you have creamy, soft-serve-style ice cream that is delicious. Fast, easy and fun.